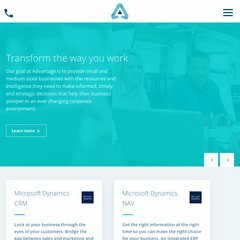 Topics: Business Solutions, Microsoft Dynamics Gp, Microsoft Dynamics Nav, Microsoft Dynamics Crm, Business Reporting, and Inbound Document Management. advantage.co.uk Public Sector Back Office Solutions | HR & Finance | From ..
advantage.co.uk Contact Advantage Business Systems to find out how we can help you ..
advantage.co.uk Specialists in Business Management ERP Solutions |Microsoft ..
advantage.co.uk ERP Careers | Microsoft Dynamics | From Advantage Business Systems ..
On average 1.60 pages are viewed each, by the estimated 124 daily visitors. The programming language environment is PHP/5.2.17. ns1.uk.colt.net, and ns0.uk.colt.net are its DNS Nameservers. PING www. (217.160.118.87) 56(84) bytes of data.